The Persian Leaps: Pop That Goes Crunch! Minnesota’s Persian Leaps have been making catchy, guitar-based power pop since their formation in 2012. They’ve released an EP-per-year since their debut with 2013’s Praise Elephants, and now pause to reflect on the intersection between what they knew then and what they’ve learned since. In particular, their first full-length cherry picks seventeen of their previously released tracks and reworks them with remixing, re-recording and remastering that injects into the recordings the lessons they’ve learned from playing these songs live. Some of the changes find the band tweaking the mixes, while others are more radical. The single “Entropy” was entirely rebuilt atop the original bass and drums, and “Not That Brave” substitutes a live radio appearance for the original studio take. Artists often revisit their songs, but rarely their recordings, so it’s interesting to hear the band consider how their deepened familiarity with the material impacts their view of a song’s best presentation. 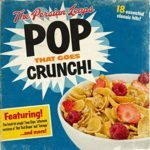 Posted in CD Review, Reissue | Comments Off on The Persian Leaps: Pop That Goes Crunch!